Cast : Rene Zellweger, Ewan McGregor, Emily Watson, Barbara Flynn, Bill Paterson, Matyelok Gibbs, Lloyd Owen, Anton Lesser, David Bamber, Phyllida Law. Synopsis: Semi-autobiographical story of Peter Rabbit creator Beatrix Potter, and the establishment of her publishing empire. Ewan Mcgregor sings again here too. Review : Handsomely mounted period film has all the classic cinematic beats that make films like this a joy to watch. Cast is excellent, story is slim but good enough to keep the audience going. Good all round entertainment. Lovingly crafted, whimsical and poignant film about the life of Peter Rabbit creator Beatrix Potter, featuring Rene Zellweger as the title character and Ewan McGregor as her publisher, and love interest, Miss Potter is a delightful film that will entertain almost everybody except small children. Small children probably won’t get it. Which is strange, considering the point of the film is simply to tell the story about one of history’s greatest children’s authors. Miss Potter begins with Beatrix obtaining a publisher for her stories, which, as we soon learn, she’s been telling since childhood. Her mother, seeing this as a particularly unbecoming disposition for a woman of her “breeding”, tries in vain to dissuade her daughter from what she sees as a foolish lark. When Beatrix stumbles into the Warne Publishing house and scores herself a trial run of her book, she is delighted. The Warne Brothers, sensing a failure, look to their newly interned younger brother to take up the task of turning Beatrix’s story into a workable book, both in terms of cost and presentation. Norman, the younger brother, immediately takes to Beatrix, and she to him, a bubbly little professional relationship that, eventually, turns more personal than Beatrix’s mother would like. Beatrix wanders through the countryside. And when her books take off in popularity, and she becomes quite wealthy, the opportunities of life open up to her in a way she never realised before. When she realises her love for Norman, and he for her, things begin to move at a rapid pace for them both. It’s then that things get a little sticky, since Beatrix’s parents disapprove of the relationship, and impending marriage. So they propose a small cooling off period, taking Beatrix to the country to ensure the ardour they have for each other is real, and will last the distance. Miss Potter is directed by the sure hand of Chris Noonan, the man behind the original Babe film, and his ability to craft a human, humorous and wonderfully uplifting tale of courage, dogged persistence and ultimately, one woman’s journey to become a successful author. Rene Zellweger is great as Beatrix, her British accent staggeringly good (highlighted by the usual American accent she has, which sounds positively awful by comparison) and ability to invoke emotion from the audience a real talent. Ewan McGregor, cast as Norman Warne, her publisher and love interest, is sprightly and delightful, his cheerful grin and vigorous disposition ensuring he’s more than a match for the eloquent and forthright Beatrix. Mention must be made of Beatrix mother, played by Barbara Flynn, who does a superb job as the overbearing and supercilious woman of the house, intent on seeing her daughter married off to some eligible, suitable, man. Flynn plays it as directly and straight as possible, and while we may hate her character, there is no denying that the woman can act. Beatrix’s father, played by Bill Paterson, is the voice of reason in the Potter household, and more often than not, the balance between his wife and his daughter, as they spar constantly about almost everything. Both these two performances are the glue holding up Zellweger and McGregor, making the film a real character driven piece in an almost ensemble style. Miss Potter is unashamedly an “awww’ film, where you find yourself going “aww” all the time. It’s utterly lovely, a testament to true cinematic technique than simply being able to shove a camera into a corner and catch somebody doing something…. The whole film feels crafted, rather than edited, which is wonderful to watch. As far as being a “chick flick” by any stretch, yes, Miss Potter is designed to appeal to the female members of our species, and yes, most red-blooded blokes will probably skip over this in the video store. But for those looking for a more appealing, cerebrally stimulating film to watch, rather than the latest gunfest from Tarantino, will find much to love about this low-key affair. 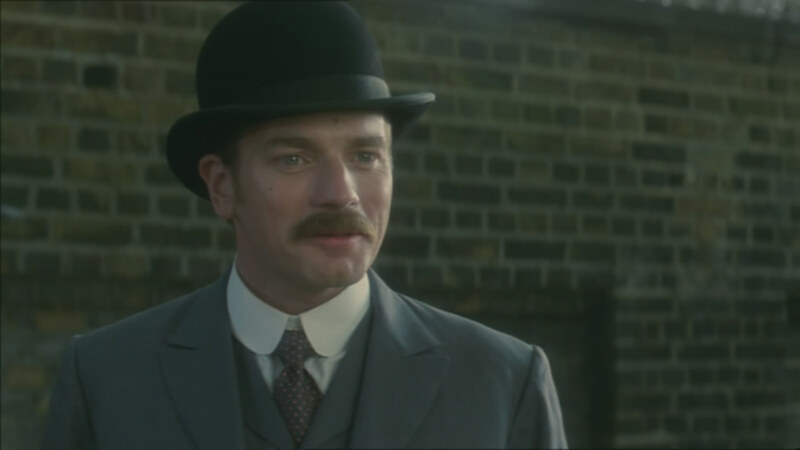 Ewan McGregor as Norman Warne. The film is shot on location around areas Potter inhabited during her life, including London and the lakes District in Northwest England, and looks an absolute treat. While not a traditionally shot period film (since the story is set in the early 1900’s) using massive costuming and lavish set’s, the film still retains a somewhat gritty, urban charm, as potter skulks about London trying to get her book published, and then the bright green countryside swells up into view, and you get some idea of why Beatrix lived out the last of her days there. Such delightful location shooting adds a depth and sense of occasion to the story, which focuses less on the books and more on the relationship Potter had with her characters, and her family and friends, including Norman Warne. Some delightful animation of her characters, as they interact with her throughout the film, is done in the style of Potter herself, in traditional cell animation, and is simply gorgeous stuff. Like the modern fairytale that was Babe, Noonan has again crafted a film filled with wonder, emotion, and even a little mystery, something that helps to serve the framework fo the films overall narrative. Potter wasn’t as eccentric as the film would have you think, according to many reports, although the scatterbrained attention to her drawings and the lack of interest in being “normal” in a society preoccupied with the suffocation of women’s rights and keeping them under lock and key is a primary catalyst in her narrative as a whole. 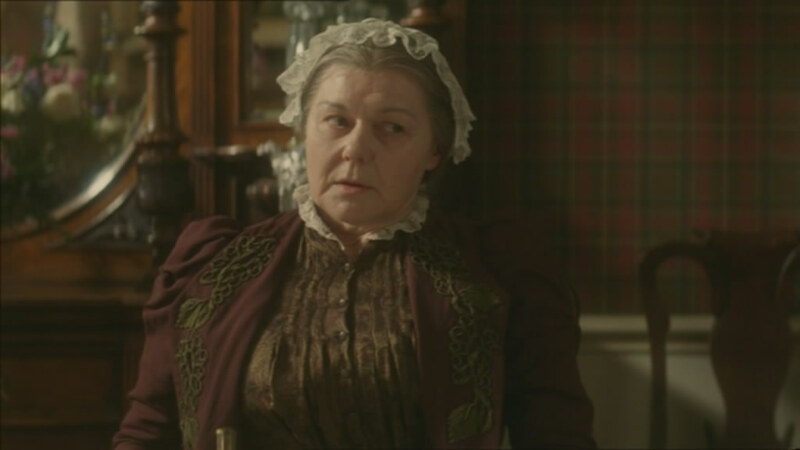 Barbara Flynn as Beatrix’s mother. Miss Potter comes highly recommended as a film to watch when you want to watch a piece of entertainment, a film devoid of traditional Hollywood-isms and clichés, and instead, tells a fairly straightforward story of one woman’s life, and how it changed the world, plainly, simply, magnificently. Miss Potter is a very good film indeed.